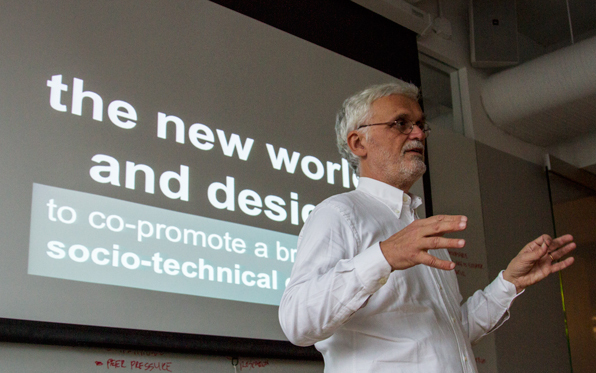 Italian design strategist and leading sustainability expert Ezio Manzini gave an intimate talk to Products of Design students on Monday, 10 December. His presentation linked design strategy to strategic change by showcasing distributed systems and collaborative models that support resilience. Ezio Manzini is author of numerous design books, professor of Industrial Design at Milan Polytechnic, and founder of the DESIS (Design for Social Innovation towards Sustainability) network of university-based design labs. Manzini's research redeems users as surprisingly active, collaborative and inventive stakeholders. Two examples he highlighted were the adoption of community supported agriculture (CSA) in Beijing, and the emergence of digital platforms in suburban London that connect family care. He saw inventive social processes of co-production as an important emerging norm, along with values such as human scale, mutual trust, slowness, complexity and localism. Taking a moment to address hands-on makers around him, Manzini talked about the empowering new wave of popular enthusiasm for experience, craftsmanship and quality. Quality-of-life has emerged as a primary concern for all, said Manzini, rather than a secondary need that designers merely service. Using the metaphor of an archipelago, Manzini said that this paradigm shift might seem small, but we may be at "the beginning of a new continent," seeing "the first dry land of a tectonic shift." Manzini discovered that resilience emerges from the intentional design of systems that are distributed, rather than merely centralized or decentralized. Citing the Fukushima disaster of 2011, Manzini illustrated the incredible fragility of large, hierarchical systems. Today's designers promote sustainability as new systems architects, but also as activists or facilitators, who create favorable environments for change when "triggering," "supporting" and "co-promoting" a "broad wave of social-technical experiments." Designers can further expand their impact by collaborating with non-design actors to organize grassroots initiatives. He encouraged students to find service model inspiration in small European communities creating economic crisis-era alternatives to market exchange. Manzini closed by offering current students a suite of options for further investigation, from small enterprise incubation to the "maker movement."